The birthing process is a very traumatic process for your baby to go through. As chiropractors, we’re here to help you set your child up for a healthy life. Chiropractic care is natural, drug-free and can help your child heal and overcome a variety of issues. With a healthy nervous system, every other system can function as designed. When it comes to your little ones, having that healthy immune support from a young age is crucial. We focus on teaching parents how important it is to keep their child’s nervous system working as best it can. Chiropractic care is a gentle and safe way to relieve any nerve pressure in your child’s spine. Caring for children is a passion of ours as we have raised our own children with chiropractic care primarily and know that it works in many cases. We’ve seen chiropractic help common concerns ranging from constipation to ear infections to sleep difficulties. Chiropractic can not only relieve the child but help de-stress the parent. Adjustments stimulate children’s immune systems to heal faster and stay healthy by avoiding illness such as colds. Often, parents are amazed at how a child with a fever will have a reduced temperature after receiving chiropractic care. Chiropractic can also help to calm special needs children with autism, ADHD, ADD and any condition that indicates a faulty nervous system. We pride ourselves in teaching parents that the is hope beyond the common medical approach. We believe that a child’s body can heal itself with our help by relieving spinal nerve pressure. Chiropractic adjustments increase your immune system by 300%. Chiropractic care can truly help your child in a safe, gentle way. We’ll show your child our instrument, the Tempo-scope, show them how it works and explain to them how we check their spine with it. We attempt to make visits fun in the midst of getting them adjusted and reward them with a sticker. We’ll ensure your child is comfortable and relaxed and do all that we can to make their experience a positive one. The sooner the better is the perfect time to start! 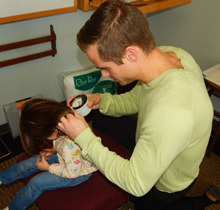 From day one, your child can receive chiropractic care as our adjustments are gentle and specific enough for any age. Both Dr. Randal and Dr. Levi‘s children are often adjusted, which began immediately when they were newborns. Dr. Levi’s young children are enjoying the natural effects of chiropractic healing from day one. Are you wondering if chiropractic care can make a difference in your child’s life? See them smile even brighter! If you have questions or concerns, Call us at (920) 743-6919 today. We will gladly discuss your child’s situation with you.